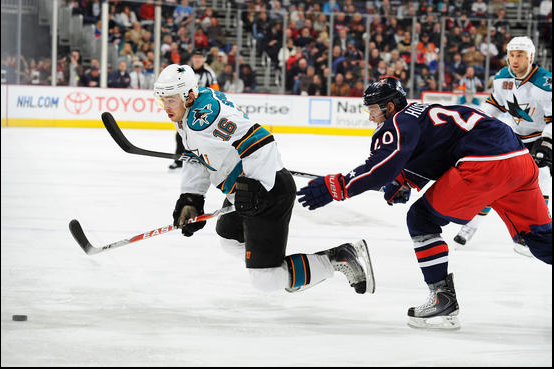 Quite the feeble effort from the Sharks tonight as they lost to the Blue Jackets 3-0. It’s the first time the Sharks were shut out by a team in regulation since Dec. 18, 2008 against Detroit. San Jose didn’t come to play until 10 minutes left in the third period. The shots are deceiving — 40-21 for San Jose. Very few of those shots had chances to go in except for a few late in the game. The Sharks have been playing sub-par lately and this could be all that bad play adding up into one poor game. Columbus came out skating really fast and winning battles, while the Sharks were content to let goalie Thomas Greiss save them. He didn’t play too bad, but he’s certainly not at the level to steal games at will. Most Sharks shots were with no traffic in front of net, giving an already-hot goalie in Steve Mason, confidence. Mason used that too his advantage in this third to put on a spectacular show of skill, notching his second consecutive shutout. I think the Blue Jackets have a great coach in the making with Claude Noel. During an in-game interview he asked the broadcast guys if they were enjoying the game as much as him and ended the conversation by saying “a lot of love.” Cool guy. Hope he does well. Newcomers Niclas Wallin and Dwight Helminen were arguably the best players on the ice, especially Helminen. When all seemed bleak, I saw Helminen zipping around the ice trying to make plays and setting up guys for chances. He finished with five hits and one blocked shot in 12 minutes of ice time. Wallin, like Helminen, was one of the few Sharks who stayed even (+/-) for the game. He amassed four shots, missed another three and blocked one. That’s pretty much all there is to say. Maybe it’s my newly acquired cold/sinus infection, but the game was noneventful from the Sharks perspective. I’ll leave it at that. The Blue Jackets announcers noted the Sharks are fifth in giveaways. That sounds about right, but the Sharks actually had zero giveaways for the game. Is that probably from the way Columbus people score giveaways? Probably since Columbus only had four. Each arena scores hits, giveaways, etc. differently, but still — seeing a zero in that column is like seeing Kate Beckinsale and Carrie Underwood wake up on either side of you. Hit-O-Meter: SJ 22 CBJ 36: Helminen led with five. The Sharks travel to Detroit for the back-end of their back-to-back. Evgeni Nabokov will get the start in net. Quite the activate-Edmonton-Oilers-mode game for the Sharks, and when they activate that notoriously awful mode, there’s only one team they could have faced — the Detroit Red Wings. Yep, you guessed it. Another Sharks loss to the Wings; this time the score was 4-2. You know Sharks, why even bother playing this team? Why? Why do you even put your skates on or even wake up the morning of these games? You know you’re not going to try. You know you’re going to blow it. Just stay home. 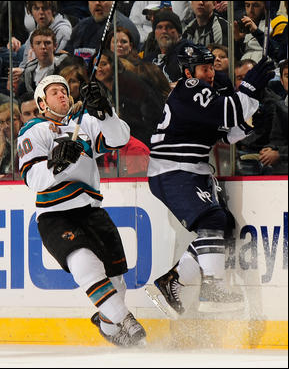 Bring up the Worcester Sharks to take your place, and let’s see what happens. What’s the worst that could happen? A 10-0 loss maybe? That’s about as good as any other Sharks/Wings game has been for San Jose. It’s utterly ridiculous. I was so ecstatic to see Sharks broadcaster Randy Hahn post a blog in which he stated it’s time for the Sharks to start gearing up for big games like this. Stop with the “it’s just another game” BS, because I got news for ya — it ain’t workin’! Anyway, I guess Joe Thornton saw my video about him before tonight’s game because he played a lot better (only two giveaways). He scored the Sharks only two goals; both came in the first period on rebounds. But then once again, the Wings scored four straight goals to win the game — just like they did in that 4-1 whooping earlier in the season. I’ve run out of things to say about these Sharks/Wings games. What more can you say about this crap? I guess I’ll go the referee route for fun. Ever notice the Wings struggle all year, but when the Wings play the Sharks, some switch turns on. The Wings get all the crucial calls and any Sharks power plays are negated. It’s truly inconceivable how bad refs are in these games. Tonight the Wings had double the power play time and took advantage of it. Two of their four markers came on the power play. When the Sharks pulled their goalie at the end and received a power play, it was short-lived of course. God forbid San Jose EVER gets a chance to come back! Oh me Oh my! We refs can never let such a thing happen. And they didn’t. 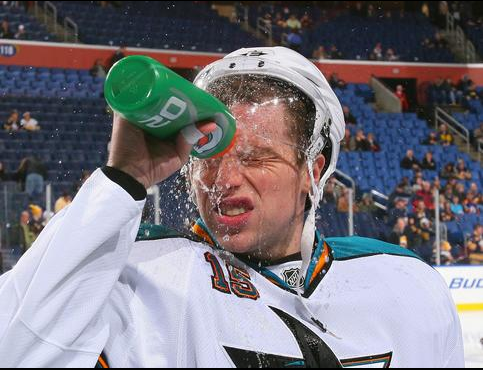 Thornton got called for goalie interference. There goes that chance down the toilet. Thanks for playing Sharks. So on top of not putting effort into games (maybe refs are the reason) and getting awful calls, the NHL should ban Sharks/Wings games. There truly is no point in them. Let’s get to individuals now, and I’ll start with injuries. Dan Boyle missed yet another game, and it’s turning into one of those annoying “game-time decision” fiascos that always ends in a scratch. Do us a favor and put him on long-term injured reserve. There’s no point in playing him until after the Olympics. Let him rest. Let him play for his country. Move on. Marc-Edouard Vlasic missed the game as well, which left a giant defensive hole on the Sharks blueline. So with two defensemen out, that means two had to be called up. Jason Demers and yes, my friends, our favorite little pinata — Derek Joslin. Joslin lack of hockey intelligence is ground-breaking. Position error here — DET goal — position error there — DET goal. I looked up ole Derek on Facebook (you have to login to see), and he indeed has one. You can peruse his pictures, and you’ll find some interesting photographs. Two that stick out are him and his friends peeing on a building and the other is him and his friends peeing off a boat. Class act that Joslin. Urine-filled lakes coming to a city near you. I think it’s been a few years since Detroit has won the season series against the Sharks. 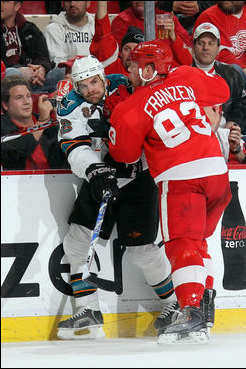 The one time the Sharks owned the series is when Detroit later knocked them out of the playoffs. Maybe it’s the reverse this time around? Hope so. Hit-O-Meter: SJ 26 DET 24; Scott Nichol led with seven. Will some media member just go around asking every coach and player, “Why the hell can’t you beat the Red Wings? Seriously what is your malfunction?” But noooooo. Let’s be politically correct and boring. The fans want to know it, so ask it. Simple. The Sharks now embark on a six-game road trip leading up to the Olympics. 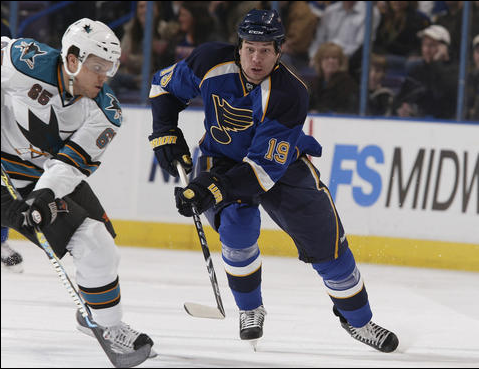 It starts Thursday when the Sharks go to St. Louis.